Over the Christmas period, each team member is sharing their product of the year. For Mike Thornton , it is RX6 Advanced from iZotope. iZotope have today released RX6 Standard and RX6 Advanced and also added a new product, RX Elements which replaces the RX Plugin Pack and includes the RX 6 Standalone Editor application as well as the plug-ins that were in the RX Plugin Pack. New modules in RX6 include De-rustle, De-wind, Dialogue Isolate, and De-bleed. 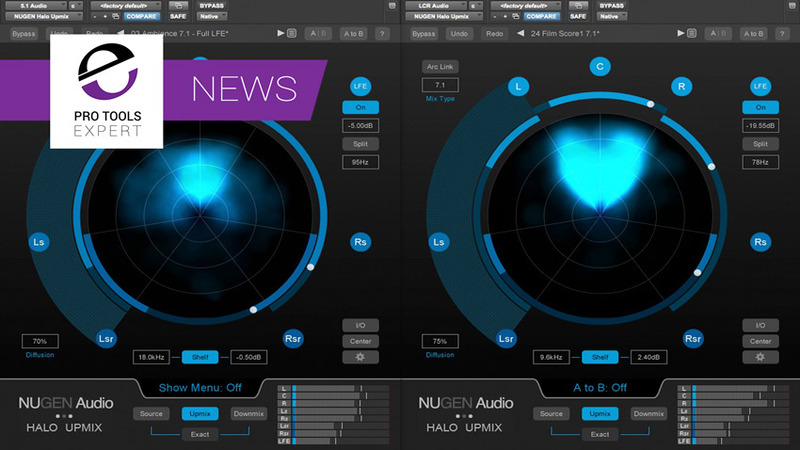 Today at the start of IBC 2016 Nugen Audio have announced another update to their Halo Upmix plugin on its first birthday. The key new feature is the support of other multi-channel formats as inputs, because up until now Halo could only upmix from stereo source content. Most of us that record close vocals use or should use pop filters when recording. There are many companies that produce pop filters, from the cheap product you might find on eBay that is lightly to fall apart after screwing it on your microphone stand 3 times, to ones that last a life time but cost a relative small fortune for a piece of metal and fabric. The guys at Pop Audio have come up with an interchangeable pop filter that wont break the bank and is extremely well made, at Pro Tools Expert we thought it was about time to check them out. In this video review Dan Cooper takes a look at Melodyne 4, the latest version of the pitch and time correction software that for many years Dan has felt is the best around. We get to look at a lot of stuff running our blog, but what 5 additions to my studio am I most glad I made in 2015? Russ takes a look at Red Giant PluralEyes 3 5, a piece of software that claims to be able to get multiple video and audio sources in sync in seconds. Does it live up to the claims? Find out. In this video James, with a little help from singer Rose O'Connell and band The Talent try out the new d:facto II microphone system from DPA. What are the benefits in being able to take a studio quality condenser mic and convert it to be able to run with a professional wireless system. Today ADL have released the latest version of their award winning upmixing plug-in, Penteo Pro - Penteo 7 Pro. They have jumped a couple of numbers from Penteo 4 Pro for good reason as one of the key new features in Penteo 7 Pro is that it now supports up to 7.1 upmixing making it ideal for including in immersive sound workflows like Dolby Atmos or Auro 3D. If you’re a regular listener to the Pro Tools Expert Podcast you are probably aware that I have a Digi 002 that I have had since I traded in my Digi 001 some years ago. I will probably be in the market for a new interface in the not-very-distant future. Until earlier this year I was generally content with the inputs and outputs on the 002 as I was primarily focused on creating music “in the box”. I was well aware that I could expand the number (and improve the quality) of mic inputs by purchasing one or more preamps but I didn’t feel the need. My needs have been changing. Now that I have decided to offer studio services I need to have more inputs (and outputs). After evaluating my options and reading other reviews I purchased a used Focusrite Octopre Mk II. I understand that there are both higher and lower end preamps available. For the foreseeable future I’ll continue to use other rooms for tracking or rent gear when I want to use boutique quality pres. I have been very impressed with the sound quality and the price/performance ratio of the Octopre (even at the street price for a new unit) for the types of work that I am doing in my project studio. About the same time that I had purchased the used Octopre Mk II, I got this opportunity to evaluate and review the Octopre Dynamic Mk II.